No matter the project, human resources teams can use our template to set priorities, track progress, and streamline recurring work. Streamline recurring work. Establish repeatable processes for common HR workflows—such as quarterly planning or review cycles—so you can spend less time planning work and more time getting it done. Set team priorities. Make sure everyone knows which tasks are mission-critical, and which are nice-to-haves, by defining and prioritizing goals across your team. Communicate progress. Track and share updates in one place (like Asana) to keep everyone on the same page without the endless email threads. With an ever-growing number of employees, Carta needs Asana to keep everyone in the loop from day one. The first day is monumental for you and your new hire. Hit the ground running with these six tips. Watch our quick tutorial to see how project management works in Asana. Regardless of what you’re working on, these tips will help you manage projects like a pro. 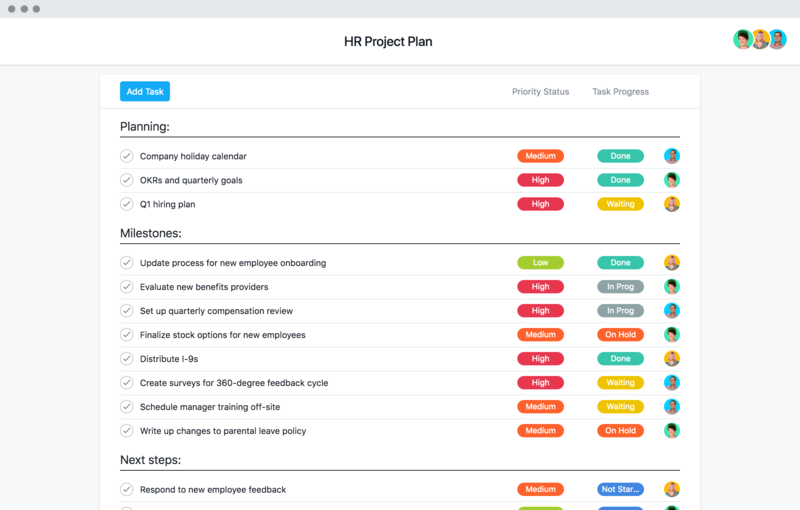 Get our HR project plan template with a free trial of Asana Premium.